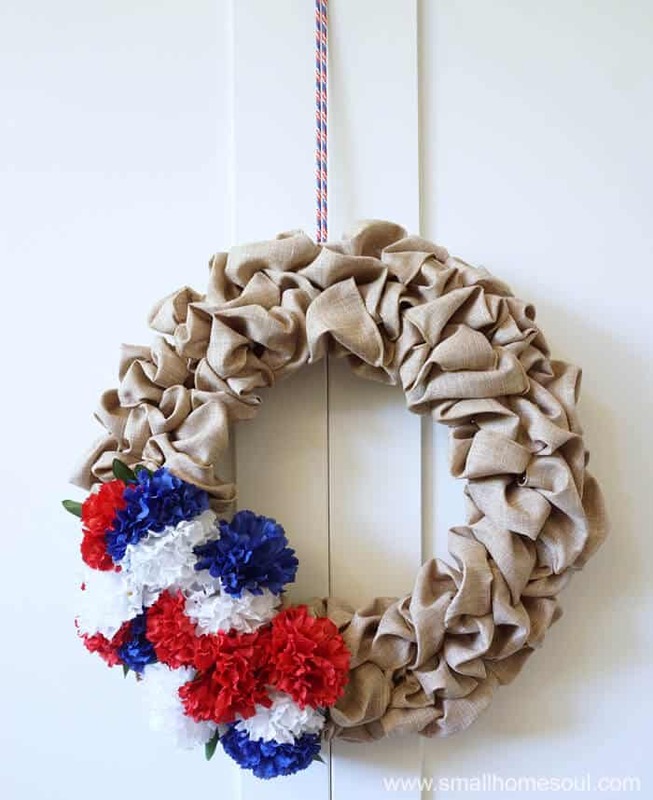 July 4th Wreath - Seasonal Wreath Update - Girl, Just DIY! 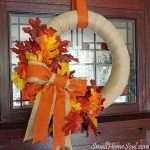 Hello friends, I’m going to share a quick, and I mean quick, update you can make to the seasonal wreath I introduced earlier this year. After I first shared the seasonal wreath earlier this year I updated it for Easter. 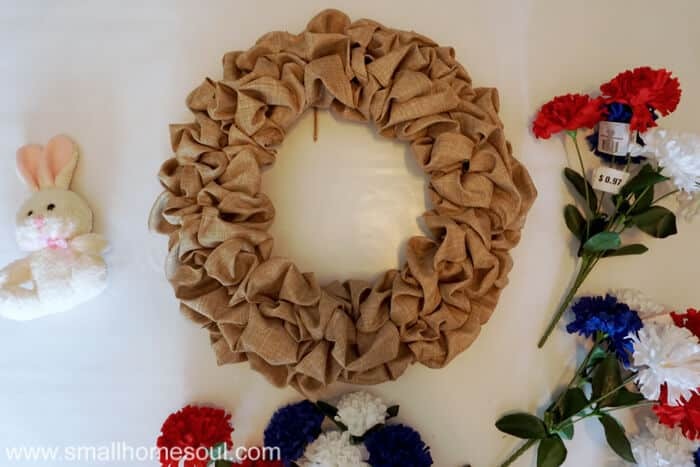 And now I’ll show you how easy it is to make a July 4th Wreath from a basic bubble wreath. 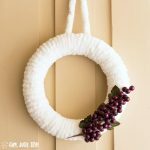 I don’t have a lot of storage space, which is why I created a Seasonal Wreath that I could easily update for the current season when the mood strikes me. This has worked out very well for me so far. And since I’m making the decorations temporary there is no need for a glue gun. So the process goes pretty quickly. First deconstruct the Easter Wreath and save the parts to use later. 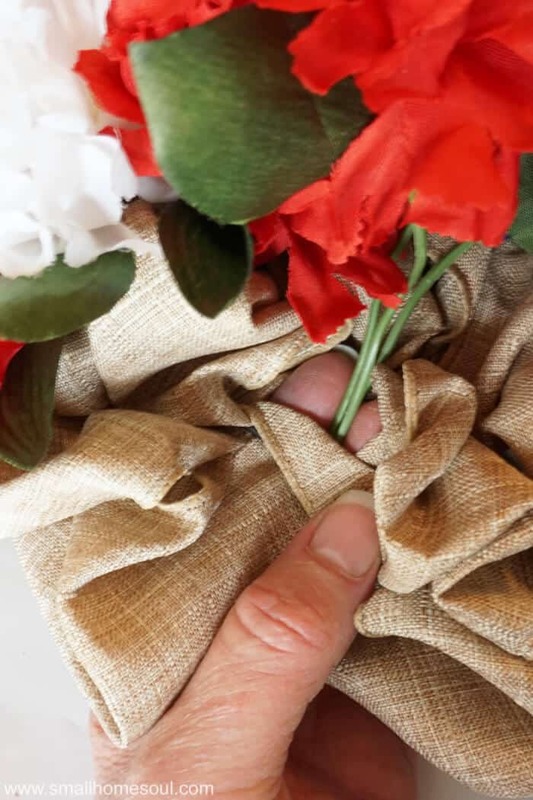 Cut carnations from the stems using a wire cutter. Leave about 6 ” of stem on each one. You can cut excess later if needed. 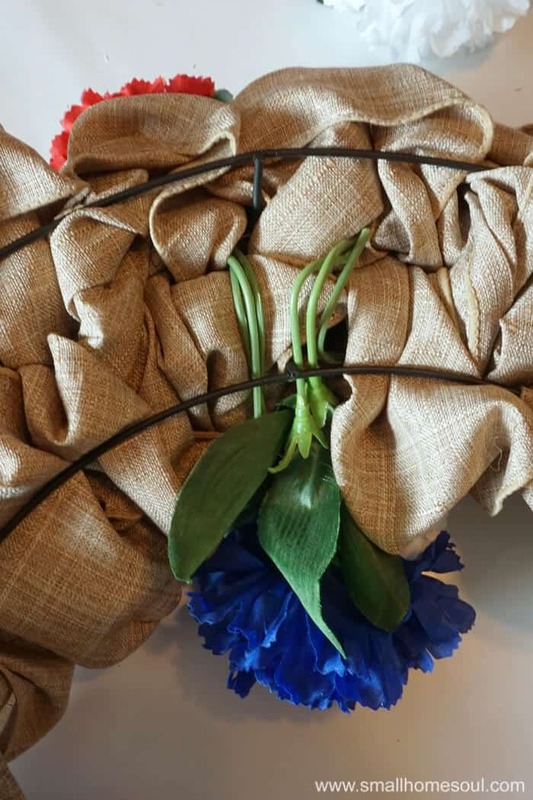 Gather a red, a white, and a blue carnation and twist the stems together a bit. Determine where you want your flowers then poke around a bit until you find an opening like below. Then insert your stems. Turn the wreath over and bend the flower stems and tuck them into the underside of the wreath or under a support wire. 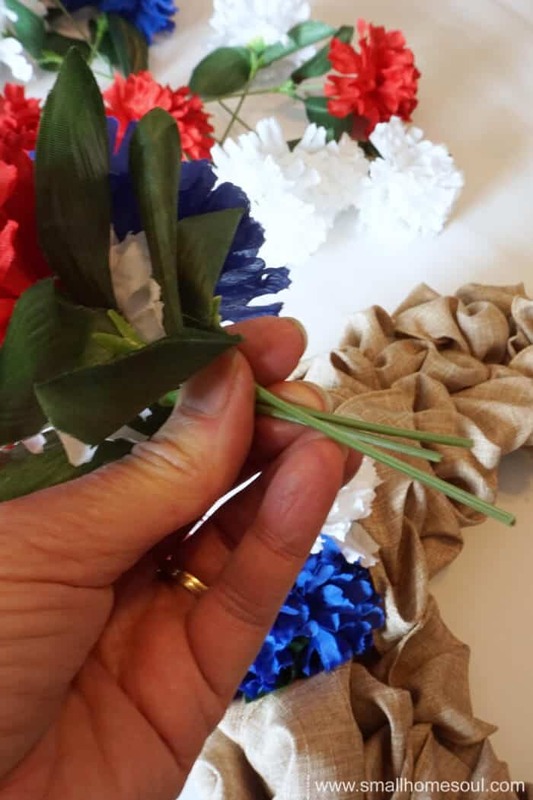 Keep working in groups of three until you have the flowers in an arrangement that looks perfect for your July 4th Wreath. 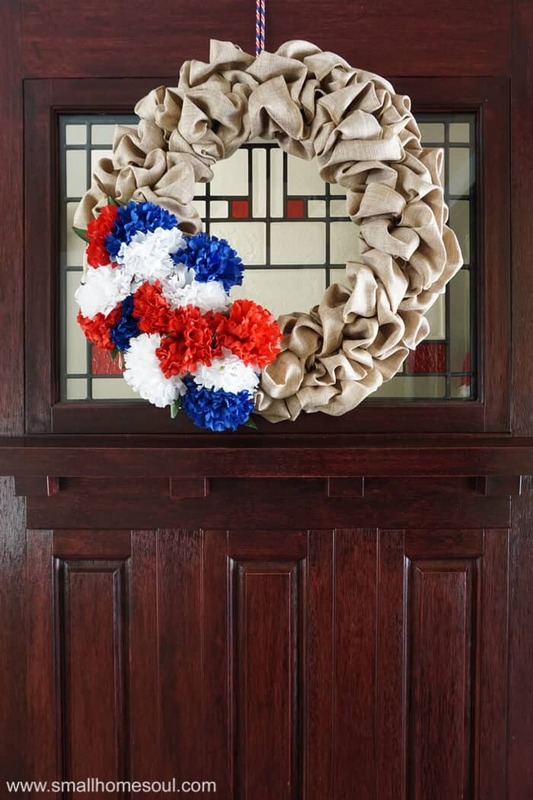 Use a patriotic shoestring like I did or a length of ribbon to hang it from your door. 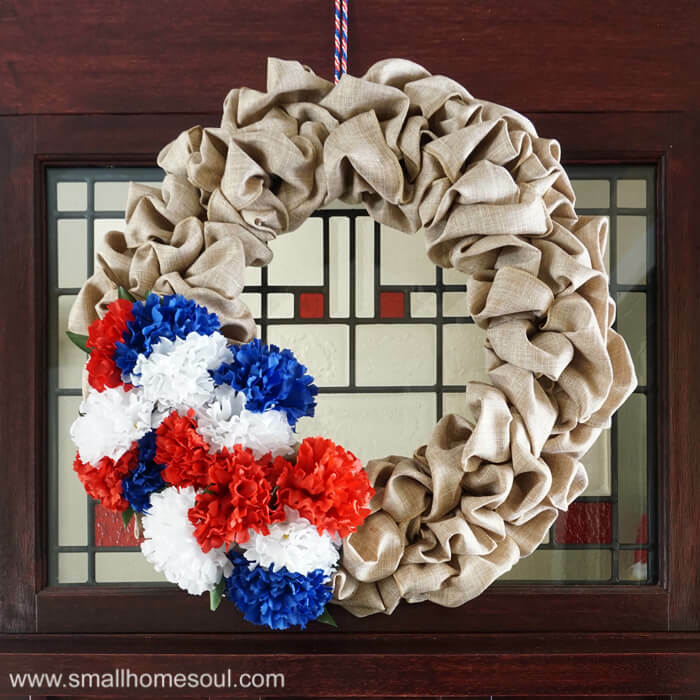 This is what the newly updated July 4th Wreath looks like hanging on our front door. What a festive welcome to greet our friends and family. I can’t wait until it’s time to start putting up the rest of our 4th of July decorations. 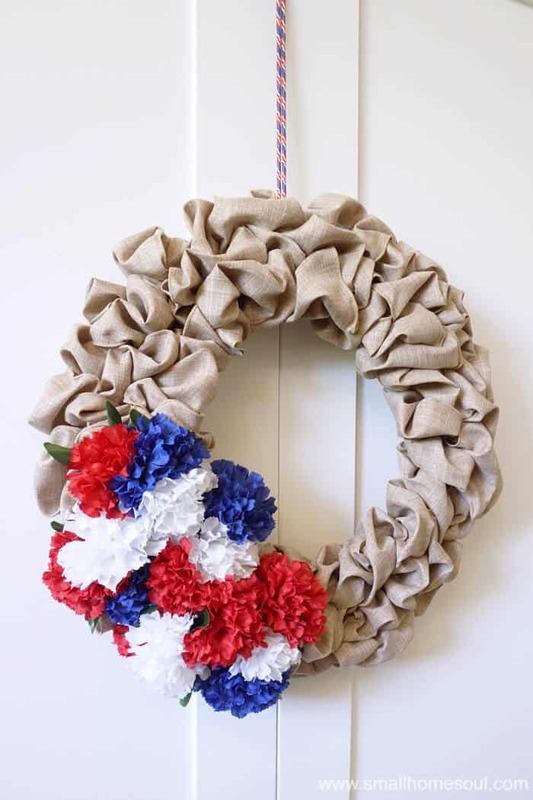 I’m very happy using this Seasonal Wreath, and the update to a July 4th Wreath looks perfect. I can’t wait to see what fun shape it will take the rest of the year. 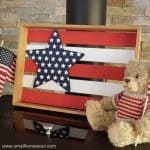 Have you started thinking about your 4th of July decorations yet? You are so clever to use the same frame and change out the seasonal decor. 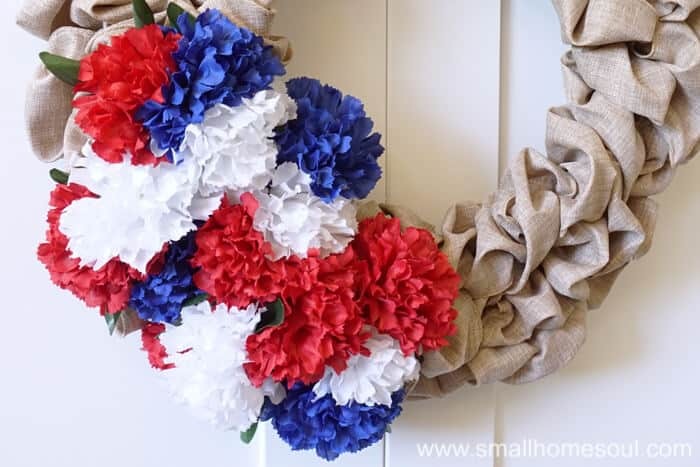 I love the red, white, and blue flowers as 4th focal points! I’ll stop by and pick up the items to get this wreath going. I’ll also put you on speed dial just in case I get into trouble. 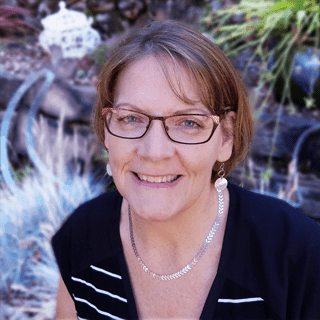 LOL… Hugs—Susie from The Chelsea Project ….Stumbling!!! I can’t take credit for the idea but it is pretty smart, and thank you, those Dollar Store flowers really jazz it up. I also don’t do much decorating inside for the 4th, usually only on the patio if we’re having guests over. But I’ve made a few things this year so maybe I’ll get more serious about it in the coming years. 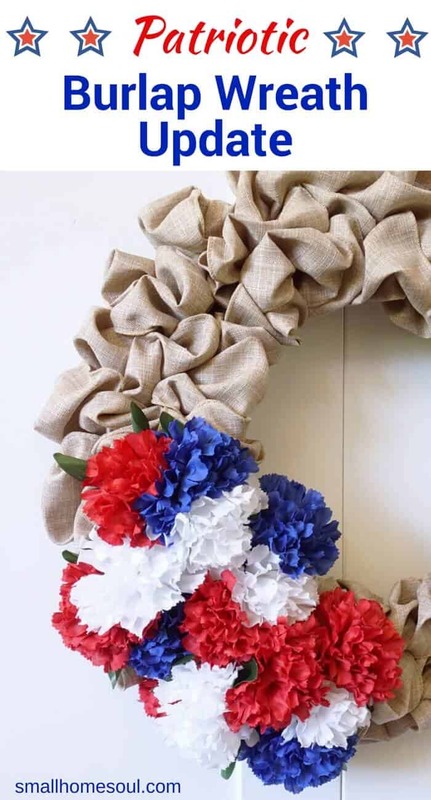 Your patriotic wreath is fabulous! I love the pops of color with the neutral color. 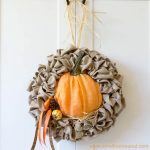 Updating a wreath seasonally is such a great idea. Thanks for sharing at Celebrate the USA Party. Pinning. Thank you Beverly, it’s not my idea originally but I’m sure glad I learned about it. 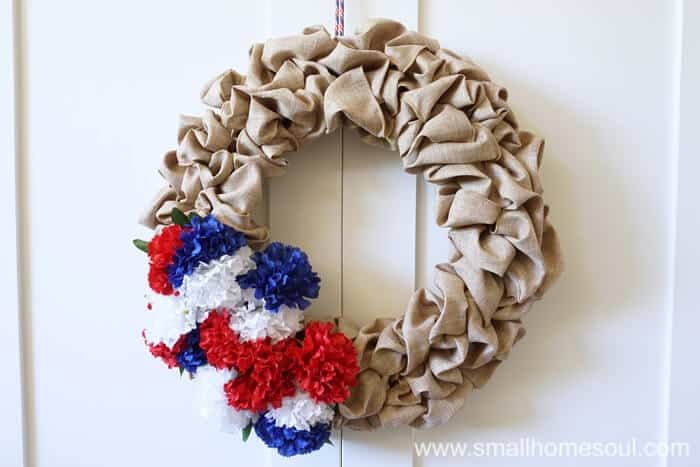 Such a space saver, now I need to plan my wreath updates for Summer, Halloween and Fall. Thank you Christina, my last update at Easter I used wire to hold a few parts in place. You have to get creative but it makes updating it later so much easier. Perfect for the 4th coming up!! !